The Phylochip, developed by Gary Andersen, of Lawrence Berkeley National Lab, and colleagues, has won a Wall Street Journal, Technology Innovation Award. For more see the Wall Street Journal here. Their phylochip is a microarray which can be used to rapidly survey rRNAs from different organisms and get a measure of the types and abundances of organisms present in a sample. It is similar in concept although different in design from a rRNA chip that was used by David Relman, Pat Brown, Chana Palmer and others. Not sure why the chip from Brown et al did not also win the award (it probably was not nominated, or something like that), but still, always good to see cool things in microbiology win awards like this. Well, I already gave him one of my awards, so what else could he do? Anyway, always good to see Open Science getting promoted and nice to see Voice of America running a story on Joe Derisi after his Heinz Award and featuring this openness (listen to an MP3 of the radio story here). And they even interviewed me because of my blog about him. Blogs and the "real" news merge closer and closer every day. 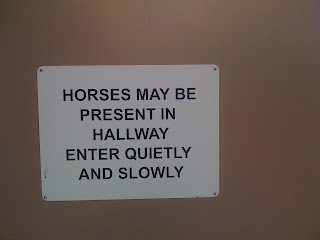 Here is another funny science related sign. I think this was from the Grand Canyon or somewhere near there, taken by my mother, many years ago. Like I needed any more justification to not trust organisms bigger than a large protist. See here for more detail. Also see the ad on Oakley's blog. I know others have written about this already but I had to add this to my collection of Science Faux Pas because it is pretty good. Nature had a recent issue that was covering the US election. And look at the front and back cover ... they claim it was an accident but hard to imagine given the posing/color matching. I note I first heard about this from Bora on FriendFeed. And now the Times Online has a whole story on it. 1,400,000 Roche 454 Sequencing Machines (for $500,000 each). If you had money for reagents, that would get you a lot of sequencing. 29.16 billion liters of sterilized LB broth (from Sigma at 12$/500 ml). That is one big vat of LB. It is also about 11,666 olympic swimmings pools worth of LB. So it goes. I was always thinking of writing this type of blog about the money spent on the Iraq War. But this "bailout" $$$ got me thinking again. And please post your own lists of what else this $$$ could buy. 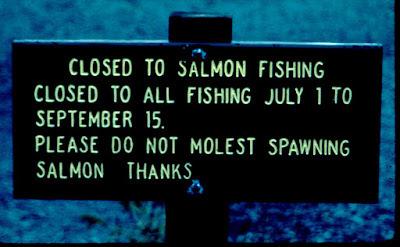 I am starting yet another thread here --- my favorite humorous science related signs. 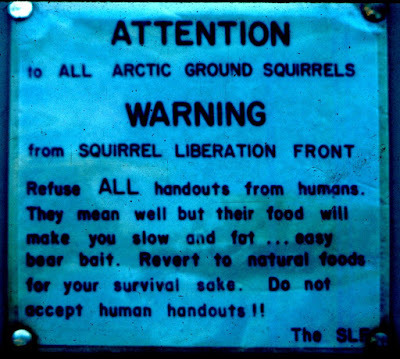 This one is from Alaska. Not sure what Sarah Palin would think of this one, but that is another topic. For those from UC Davis or the area who read the blog and have an interest in genetic engineering or synthetic biology or open science, you should come to this talk. "Post-Synthesis Genetics & Engineering Biological Simplicity"
The pictire seys it all. Note - we think this was the restaurant's fault. signs. This is one of my favorites. It has a diversity of routes for biking, walking and running in and around town. So Stage 2, February 15th, will be a big big Day for Davis. Some good new articles in PLoS Biology in the last few weeks worth checking out. There is definitely a theme there if you want to look for it. So here are some of the papers connected to that theme and even one that covers both. ThePrivacyPlace.Org Privacy Survey is Underway! Researchers at ThePrivacyPlace.Org are conducting an online survey about privacy policies and user values. The survey is supported by an NSF ITR grant (National Science Foundation Information Technology Research) and was first offered in 2002. We are offering the survey again in 2008 to reveal how user values have changed over the intervening years. The survey results will help organizations ensure their website privacy practices are aligned with current consumer values. We need to attract several thousand respondents, and would be most appreciative if you would consider helping us get the word out about the survey, which takes about 5 to 10 minutes to complete. The results will be made available via our project website (http://www.theprivacyplace.org/). $100 Amazon.com gift certificates sponsored by Intel Co.
On behalf of the research staff at ThePrivacyPlace.Org, thank you! After a lot of testing (Thanks again to all beta testers), we have released a new version of our MG-RAST server software. You will notice improvements in nearly all aspects of the MG-RAST platform and user experience. In addition to the tutorial at Metagenomics 2008 in San Diego (see: http://metagenomics.calit2.net/) we are inviting participant registration for our second MG-RAST workshop. Please send an email to mg-rast@mcs.anl.gov if you are interested in participating. Amy Harmon, who writes for the New York Times and has written some excellent recent pieces on evolution and genomics is answering some questions on the New York Times website. Of course, the one way scientists do, theoretically, communicate with the public is by publishing their results. Since these papers are written for other scientists, they can be hard to understand. But even for people game to wade through them, they are often hard to obtain. The two leading scientific journals, Science and Nature, and many others, require people to pay for access to papers whose authors have been financed by taxpayers. “Open access” publishers like the Public Library of Science do not, so it would be nice to see scientists choosing — or being required — to publish in journals that are open to the public. Nothing more for me to add. Short one here as I am at a conference. Very happy to see Stan Falkow get a Lasker Award. "The breadth and depth of Falkow’s career is being recognized with the 2008 Lasker-Koshland Award for Special Achievement in Medical Science." He is a great scientist but more importantly to me, he has an infectious (no pun intended) enthusiasm for science, microbiology, and life. For more detail, there is a really nice article in the Stanford Report about him and his career. Every time I interact with him (e.g., when I was a student at Stanford) I feel like I got a microbiology passion boost that lasted for years. And clearly he has had this effect on many many others. Congratulations to him for a well deserved award. Interesting article on David Goldstein (a co-author of my Evolution textbook) in the New York Times Mostly, it is kind of portraying him as a "maverick" in genomics (Note - Nick Wade seems to specialize a bit in portraying scientists as mavericks -- think of Craig Venter). Maverick of course is a term that is being overused in the election in the US these days and Wade does not use it to describe Goldstein, but that is the gist. Even the title "A Dissenting Voice as the Genome Is Sifted to Fight Disease." “There is absolutely no question,” he said, “that for the whole hope of personalized medicine, the news has been just about as bleak as it could be. He also sort of disses the HapMap project and related activities. Goldstein, who I went to grad. school with, certainly can be contrary. And I do not work on human genomics so I do not know how close to home his claims about the lack of utility of the HapMap. But I think his general feeling here is probably right. Human genomics, as with many other genomicy things, has been oversold by many of the practitioners. That does not mean it is not useful --- and Goldstein makes this point. It is just that we need to be careful (I think and it seems so does Goldstein) in making claims about what the benefits of something in genomics will be before we see the actual benefits. George Weinstock gave a good overview of the "Human Microbiome Project" which is a NIH Roadmap initiative to catalogue the genomic content of the microbes associated with humans. He described some of the big picture of why do the project, of the different fundingin initiatives being done through NIH and he gave some detail on the "jumpstart" project going on at the big genome centers right now. He outlined how the current plan is to select a few hundred people and to survey their mcirobiomes from multiple sites using rRNA PCR and possibly metagenomics. In addition, he described how there is also an effort to sequence 100s if not a 1000 genomes of cultured organisms that have been isolated from human environments. He did say one thing I disagreed with which is that he thinks it is somewhat reasonable to treat the environment that microbes live in in essence as a big bag of genes. In other words, if you sequence from a community, he implied that one can focus just on the genes and their functions and not the organisms that they come from. On this I disagree (and pointed this out after the next talk). But overall George gave anice overview of the project and its goals. Eric Wommack gave a good talk about viral metagenomics work he has been doing. He pointed out that a lot of the viral world is "unknown" but that does not mean it is unimportant. And this is consistent with what I and George Weinstock said which is that we need more genome data from viral isolates. Eric presented some very useful results on the challenges of using short read sequence data in metagenomics and he referenced a few papers on this. He also referred to a cool viral genome survey project that I was not aware of by Hatfull which involved undergraduates in sequencing and analyzing the genomes of phage that infect Mycobacterium smegmatis. Jim Bristow on Biofuels. He is now giving a summary of some of the JGI work on the genomics of cellulolytic organisms and processes. He is focusing on the termite gut community and had some good one liners about this (e.g., he said many people want to kill termites but not JGI. They are our friends; he also said "it takes a village to sequence a termite gut"). Not sure exactly how to say this, but here goes. There was one talk in the AM I was not overly fond of. This was a talk by Bernard Palsson. Now I confess, I am not overly familiar with much of his work but what I know of it suggests he does some really solid, interesting and important work on metabolic network modeling and analysis. But his talk at this meeting was disappointing. His talk was about his use of genome sequencing to characterize "adaptive evolution" in E. coli. And the results he presented seemed solid enough. The problem I had was that it was a prime example of "overselling genomics". Why? Here is what they did. They took E. coli mutants. And the then took them through cycles of growth and then dilution. And then they looked at the populations after a certain number of generations and did a variety of analyses. Included in this was some whole genome sequencing that helped identify mutations arising in the cultures. And then they did some characterization of these mutations/mutants including some competition experiments and some pretty interesting gene expression studies of some RNA polymerase mutants. And he made some conclusions based on their results like that E. coli in the lab can find new adaptive peaks and that mutations differ in different replicates, and that different mutations confer different fitness, that they can monitor the appearance of mutations over time, and so on. So what is the problem -- the problem is that he (1) presented this as though the serial cycling of E. coli was novel when in fact it is not and that (2) he presented the conclusions as though they were novel when they also are not. People have been doing this type of experiment for many decades (in fact, one person, Rich Lenski, has been doing an experiment like this for decades). And they get these exact results. But they have not sequenced genomes as part of their experiment. And thus, at least for this talk, they were not mentioned, and the rediscovery of many truisms in population genetics was presented as novel because it involved genome sequencing. Trent Northen created a serious buzz during and after his talk with his presentation of some of the things one can do with Nanostructure Initiated Mass Spectrometry (NIMS). I confess - I want his toys. Lynn Silver is now talking about the challenges in the development of new antibiotics. She argues that the focus by some on trying to find new targets for antibiotics has been a bit misguided. Julian Parkhill gave a good talk about population genomics of Salmonella. He pointed out a few things people still ignore. For example, if you want to identify polymorphisms in a species to use for population genetics/genomics studies, you really need to do a survey to identify polymoprhisms from diverse members of the population. If you do not, and then you use a biased set of polymorphisms, your population inferences will be wrong. He also said, in response to a quesiton of mine, that at least for this species, they see very little variation in copy number in genes which is different than what people seem to see in humans. Tiffany Williams from Baylor gave a talk about using high throughput sequencing in collaborations with developing countries. She outlined some of the challenges as well as the benefits from such collaborations. Kim Lewis gave a very interesting talk on microbial biofilms and persister cells, of which I know vanishingly little. He showed some very cool experiments trying to "complement" unculturable organisms and get them to grow. Jeffrey F. Miller gave a talk focusing on diversity generating retroelements in bacteria which appear to be a means by which bacteria can target particular regions of the genome for mutagenesis in a comparable way to VDJ mutagenesis in humans. This was perhaps my favorite talk so far at the meeting as it combined microbial genomics, evolvability, mutation processes and other things I tend to focus on. Steven Benner gave a talk which I had to skip out on early because I was doing a radio interview. Benner said one thing that annoyed me at the beginning - he made a comment that was complaining about prior talks that referred to "Rosetta Stone" methods of predicting function (I was one of the people who mentioned this) because he thought that we were referring to blast searches. He clearly was not paying any attention as the Rosetta Stone method is a method to predict function for genes by finding connections between non homologous proteins based upon having other proteins that have domains found in both of the original proteins of interest. Oh well, glad I had to leave early because I was itching to jump up and correct him. Heather Allen, from Jo Handelsman's gave a very good talk about doing functional metagenomic screens for antibiotic resistance encoding genes. She has been using DNA from multiple soil sites, including a pristine site in Alaska, and screening the DNA for antibiotic resistance genes in E. coli. These screens identify a wide diversity of genes, including some novel forms. This work helps highlight the need to not just sequence the snot out of the world but to also do some functional assays at the same time. In addition she mentioned that she was able to come to the meeting because Jo Handelsman set up a fund for mothers to pay for babysitters to come to a meeting with them. All I can say is Jo Handelsman was already one of my favorite people in science and this is just another brilliant and wonderful thing that she does. David Relman gave a talk about two studies of the human microbiome that his lab has been doing: (1) studies of marine mammals to compare the microbial diversity in their surfaces with the diversity in the water and the diversity on their insides and (2) study the response of the human gut microbial community to antibiotic treatment. I am particularly fond of the antibitotic treatment study because they are treating it as an "ecological disturbance" study and analyzing it much like ecologists would analyze recovery of a forest after fires. I think we definitely need more ecologists to bring their techniques and skills to human microbiome studies and so this was exciting to see. Ashlee Earl gave a talk about biofilm formation in Bacillus subtilis. Much like Kim Lamb's talk earlier, this talk was in an area I know little about and I guess you could say it kind of blew my mind. It seems that in B. subtilis and I guess in many other microbes biofilms are in essence analogous to multicellular organisms. Within a biofilm there are different types of cells that have different roles and the patterns are highly reproducible and organized. It seems to me that the boundary between multicellular and single-celled organisms is getting blurrier and blurrier. Ashlee reported on some cool experiments where she collected strains from around the world and then dod comparative genetics and genomics of their biofilm formation patterns. Alas I missed Mary Lidstrom's talk which based upon prior experiences I am sure was fascinating. She has been working in studying processes inside single bacterial cells and has been developing a suite of techniques and tools to carry out such studies. Maybe someone else from the meeting can post details about her talk. Unfortunately, I had a conference call during some of the next talks that I had to do so I do not have details for the blog. Then I returned and served as chair for a session. I did take some notes so here goes. Byung-Kwan Cho gave a tour de force talk about reconstructing the transcriptional regulatory network in E. coli. He presented results from a dazzling and dizzying array of genome-scale methods (e.g., ChipChip, tiled arrays, sequencing, etc etc) to characterize transcription regulation. In addition he did some complex and big scale computational work to combine all of the data together to characterize networks. It was quite impressive stuff. Ginger Armbrust talked about her favorite critters - diatoms and focused on how they used the genome data to characterize silicon deposition processes. She was convincing as to the importance of diatoms and to the value of having the genome sequences from some species. She did discuss some of the challenges of using the genome data including the challenges in gene prediction for microbial eukaryotes. She also discussed her dream of utilizing some of the new genomic information as part of real time sensors in the oceans. Anthanasios Typas discussed work to build tools for carrying out genome-scale analyses of genetic and chemical-genetic interactions. For example they are working on taking two comprehensive gene KO libraries from E. coli and using them to create all possible double mutants and to then screen those mutants for whether they have the same or different phenotypes than the single mutants. This allows them to look for gene-gene interactions. They also are doing this type of analysis with chemical-gene interactions. Who knows what a yoctomole is? He could not be here so I am here. His loss. My gain. Hopefully not your loss. We are the environment. We live the phenotype. Well, just in case people out there did not have enough trouble distinguishing my brother, Michael Eisen, from me (me - UCD - him UCB, me microbial genome evolution, him drosophila and yeast genome evolution, me - OA fanatic PLoS Biology AEIC, him PLoS founder and board member, and so on), here comes a new thing to deal with. My brother has launched a blog (http://michaeleisen.org/blog). Scientists cynical use of "Junk DNA"
Well, I am back. Every two years I come back to this small meeting about small genomes. The meeting is officially the "16th Annual International Meeting on Microbial Genomics at Lake Arrowhead, CA" but in reality, every two years it is at Lake Arrowhead and every other two years it is elsewhere. And I rarely go to the other one -- but I keep coming back to Lake Arrowhead. Why? Well, you might guess it is because it is at UCLA's conference center up in the mountains. But you would be wrong. You might guess it is because I generally hate big meetings and this one is nice and small/medium. But you would be wrong again. For there are lots of meetings in pretty places. And there are lots of medium sized meetings an omnivore like me could go to. I go back every two years because of Jeffrey H. Miller, the organizer. He invites me. I can never say no. Why? Well, many reasons. Sure one is that I like him. Another is that he does meetings in the right way (not too many talks in one day --- some time to relax and talk with other people and to interact, etc). But the truth is, I say yes because he is one of the few people I know who is interested in both DNA repair processes and microbial genomes. And his meetings reflect this interest. So I guess even though I do not spend enough time working on DNA repair any more, I did do my PhD on it, and I did basically try and copy some classic Jeffrey Miller mutator experiments. So I just have to go to this meeting. And here I am (see my 2006 meeting notes here) - despite having been very sick this summer and getting ready to teach a new class in the fall with 400+ students. "Microbial Sequencing for Biofuels Applications"
“Making sense of the chaff: What will metagenomic approaches tell us about viral ecology? Open Science Required Reading: MSNBC on "Era of scientific secrecy nears its end"
There is a must read out there about Open Science. Robin Lloyd has a excellent article on Open Science (Era of scientific secrecy nears its end) posted at MSNBC. I am not sure whether this was originally written for MSNBC or not nor the whole history of the piece. But the article discusses some of the issues associated with Open Science. Social networks "that are scientist friendly such as Laboratree and Ologeez"
Sharable sites like "GoogleDocs and wikis which make it easy for people to collaborate via the Web on single documents"
Citation sharing sites like "Connotea that allows scientists to share bookmarks for research papers"
Preprint servers "such as Arxiv, where physicists post their "pre-print" research papers before they are published in a print journal"
OpenWetWare "which allows scientists to post and share new innovations in lab techniques"
Video sharing sites like "The Journal of Visualized Experiments, an open-access site where you can see videos of how research teams do their work"
Sequence databases like "GenBank, an online searchable database for DNA sequences"
"Online open-access (and free) journals like Public Library of Science"
"Open-source software that can often be downloaded free off Web sites"
Sure the article gets a few things a little mixed up. For example, software can be free even if it is not open source. And not all open access journals are the same. But the article is overall very good and has some of my favorite Open Science advocates in it like Cameron Neylon and Jean-Claude Bradley. The NY Times published a few letters that are follow ups on Amy Harmon's excellent story on evolution teaching in Florida. Also check out my blog posting about her story which has links to the story and some other information. The Heinz Site says "Joseph DeRisi receives the Heinz Award in Technology, the Economy and Employment for his extraordinary breakthroughs in detecting both new and existing viruses." "Joseph DeRisi has made breakthrough discoveries in the laboratory that have provided clarity and insight into the detection of some of the world's most threatening viruses as well as distinguished himself as a generous and tireless advocate for the free and open sharing of scientific research. With a brilliant mind and expansive heart, he has ennobled the field of science." Here here. Derisi is one of the true pioneers of Open Science, not only promoting Open Access publishing but also promoting open sharing of methods, equipment, data, and everything. And, not that he needs another award (to go with his Heinz, his HHMI position, and his Macarthur among many things), but I am giving him my Open Access Pioneer Award #3 for his firm commitment to open science. They have left out a few including one of my favorites: "Mario's Entangled Bank" by Mario Pineda-Krch but the listing by UC Davis is a good thing. Lots of other bloggers posting about this but I got to put it out there too. Check out the remarkable story of the Darwin Shaped Wall Stain and how it is galvanizing the evolution community - See Evolutionists Flock To Darwin-Shaped Wall Stain. It is from the Onion. One of my favorite "news" sources. Hat tip to many many people for pointing this out. "While most people are familiar with western astrology and with the Chinese zodiac, much less is known about the ‘molluskan zodiac’ (sometimes known as the mariners zodiac). But ask any fisherman, and they will tell you instantly which of the ten signs of the molluskan zodiac they were born under." It is very very funny. And real of course. Kudos to Keith Bradnam, who happens to be from the UC Davis Genome Center (where I work) for revealing the inner secrets of these wonderful invertebrates. And while you are checking out the Zodiac, check out Bradnam's new PLoS One paper on intron length which he authored with Ian Korf. 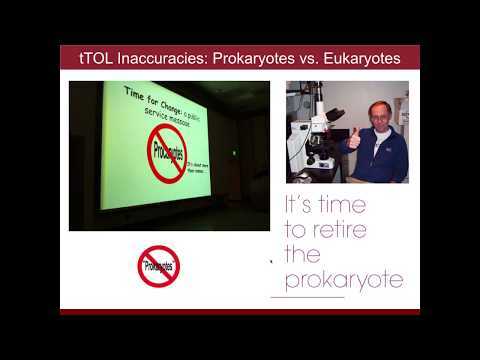 Science humor, invertebrates, and Open Access publishing. Now what could be better than that? You see, as a total sequence analysis dork, when I see names, I frequently ask whether the letters in the name include only letters which are used as amino acid abbreviations. I started this game when the brilliant notes/letters came out in Science in the early 90s about whether ELVIS was overrepresented in protein sequences. Of course, despite being 20 years old, Science still keeps these under wraps requiring registration to see them (see for example the Stevens letter). Anyway, alas, three of the major candidates for the US election have names that do not use traditional amino acid abbreviations so I am stuck with analyzing Sarah Palin. But that is OK because of her professed aversion to evolution and support to Creationism (and since sequence analysis is inherently an evolutionary study). So - I took here name and went to the NCBI Blast page and did some searches. And what came up? Well, here are some of the top hits from the blastp searches (which I used to compare the pretend peptide "SARAHPALIN" with all the peptides in the non redundant collection at Genbank). There does not appear to be a perfect match in the NCBI NR protein database. But take a close look at the #1 scoring hit. That is right, it is from and organism called Botryotinia fuckeliana. No comment on the appropriateness of this name, but it does contain a term I will probably use a lot if she gets elected. Of course, anybody who has heard me blather on and on about evolution knows that I am always talking about how blast top hits are not a good measure of relatedness per se (see my NAR paper where I first talked about this in 1995). So - I decided to build a tree of Sarah Palin. I used the NCBI Distance Tree option which you can do from blast searches. Since most likely you cannot see that in enough detail - here is a zoom in. 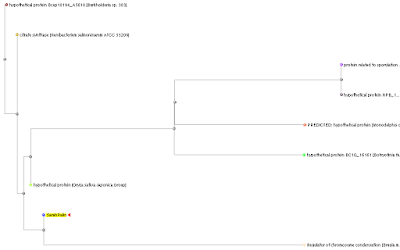 That one did not come through on the Blog so well either so I decided to output the tree in Newick format and then I searched for a program that could draw a better figure on the web (we have tools in my lab to do this but I am trying to do this all on the web as an exercise). And I found a web site that makes drawtree available. And I plugged in the Newick format and it made a nicer one. Though making trees from really short sequences is not ideal, in this tree, Sarah Palin is shown to be at the root of a branch including a protein from the parasitic nematode Brugia malayi. So if we take an evolutionary interpretation it seems that this causative agent of filariasis (well, a protein from this agent) is descended from SarahPalin. In other words, she seems to be ancestral to this parasite. So in conclusion - by similarity - SarahPalin is closest to a plant pathogen with an unusual name. And by phylogeny SarahPalin is ancestral to a parasitic nematode. Sounds about right. OK. This is far and away my favorite Science Faux Pas I have seen. I cut this out of some magazine many years ago and posted it on my door in college, grad. school and in my previous job, so it is a little beat up. 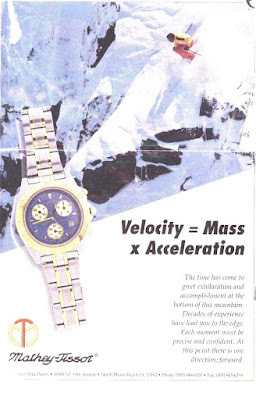 But you got to hand it to Mathey-Tissot - promoting a precision watch with "Velocity equals mass x acceleration (V = MA)." Must be one heck of an interesting mechanism inside that watch. I am starting a new series here on Science Faux Pas. Here is one of my favorites from Nature a while back. 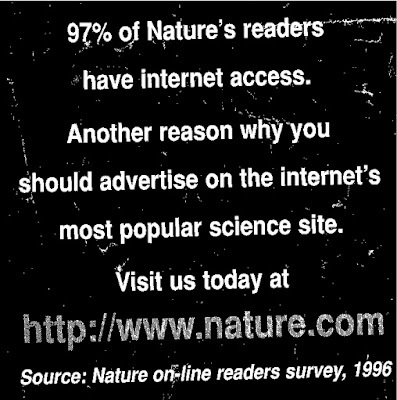 They report in this promotion that 97% of Nature's readers have internet access. How did they determine this? By an online readers survey. The real question is - who are the 3% that completed the survey but said they did not have internet access? 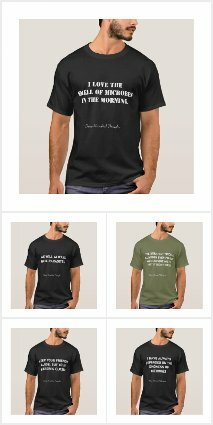 I am going to try and make a collection of these over time so if you have any or can point to some out there please let me know. It may not be as fun as Carl Zimmer's tattoo series, but there are some doozies out there. Just got this email and thought I would share since it does relate to some of the themes of my blog. I note that the Gates Foundation is VERY supportive of Open Access publishing as one of their previous grants helped support the journal "PLoS Neglected Tropical Diseases." I am hoping that at some point the Gatges Foundation will require OA publishing for all of the projects they fund. The Bill & Melinda Gates Foundation is now accepting grant proposals for Round 2 of Grand Challenges Explorations, a US$100 million initiative to encourage unconventional global health solutions. Based on your feedback, we have made changes for Round 2 of Grand Challenges Explorations. We modified the topics from Round 1 and added two additional topics. We will no longer require applicants to register for a topic in advance of submitting their proposals. We also updated the application form in response to feedback from the initial round. Initial grants will be $100,000 each, and projects showing promise will have the opportunity to receive additional funding of $1 million or more. Full descriptions of the new topics and application instructions are available at http://www.gcgh.org/explorations. We are looking forward to receiving innovative ideas from scientists around the world and from all scientific disciplines. Anyone can apply, regardless of education or experience level. If you don't submit a proposal yourself, we hope you will forward this message to someone else who might be interested. Thank you for your commitment to solving the world's greatest health challenges. Nothing conclusive here. I have not tried it yet. But Spore sure sounds like a cool evolution game to play. See Carl Zimmer's NY Times article and his blog for more. Thanks to my mom for this one. PLoS Hats rule. I spent the last few days at a "retreat" for the Joint Genome Institute and heard about a few things there worth sharing with everyone. I will try and post about some of them in the next few days. Here is one. The JGI and the Center for Integrative Genomics have made a pretty cool tool for comparative analyses of plant genomes. It is called Phytozome and has a variety of simple and nice features. 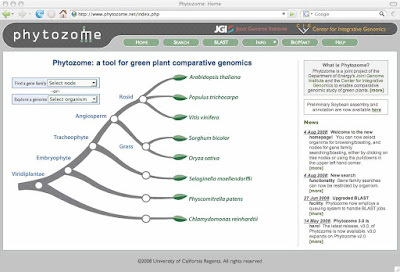 JGI is doing more and more work on plant genomes as part of their energy research and I think Phytozome could turn into a good place to go to get the latest plant genome information. Go to http://www.phytozome.net to see the real thing.